This webinar will delve into best practices, the duty to advise, and why Lawyers recommend against giving advice is a bad idea. 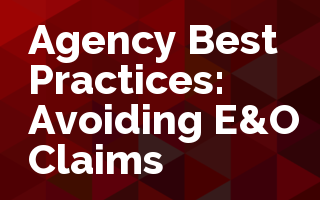 This is not your typical webinar on how to prevent error and omission claims against your agency. Numerous webinars and articles have been written over the past 45 years on obvious things such as documenting your files, making sure that important conversations are documented etc. Instead, given the complexity of today’s insurance world, error and omission claims are becoming more and more complex. This webinar will delve into best practices, the duty to advise, and why Lawyers recommend against giving advice is a bad idea. In addition, will explore relationships with wholesalers and MGA’s given the fact it is now well known, that the real reason to use a wholesale broker is not only to access markets that you may not be able to get to yourself, but also to access expertise you may not have especially as to specialty lines insurance products. This is not your father’s error and omission prevention class.